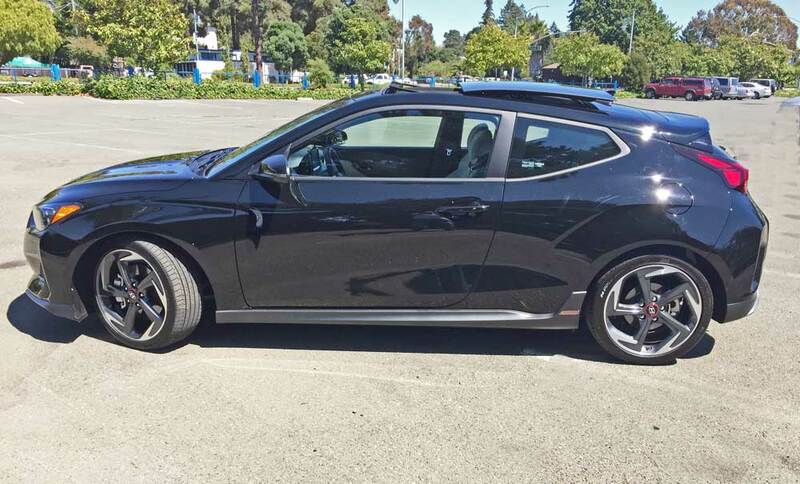 ?2019 Hyundai Veloster Turbo Ultimate Black? 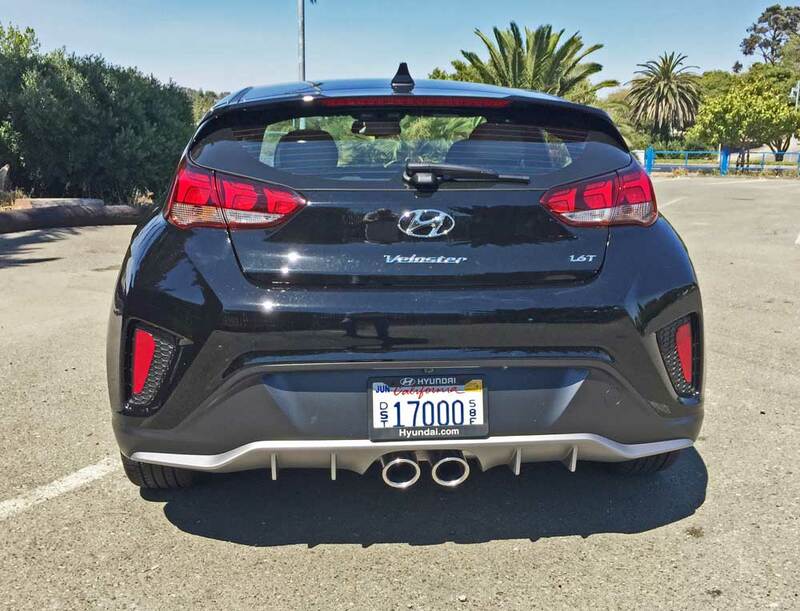 Hyundai introduced its unique Veloster Hatch back in 2012. 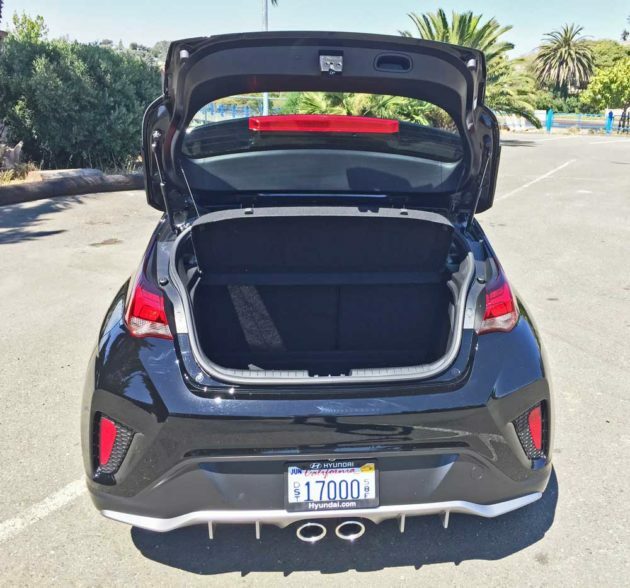 The Hyundai Veloster was and still is a three-door asymmetrical coupe that features a rear hatch with a single door on the driver?s side and two conventionally opening doors on the passenger side with the rear door actually hidden. It was designed to be a ?gateway halo? or entry level vehicle for the brand. 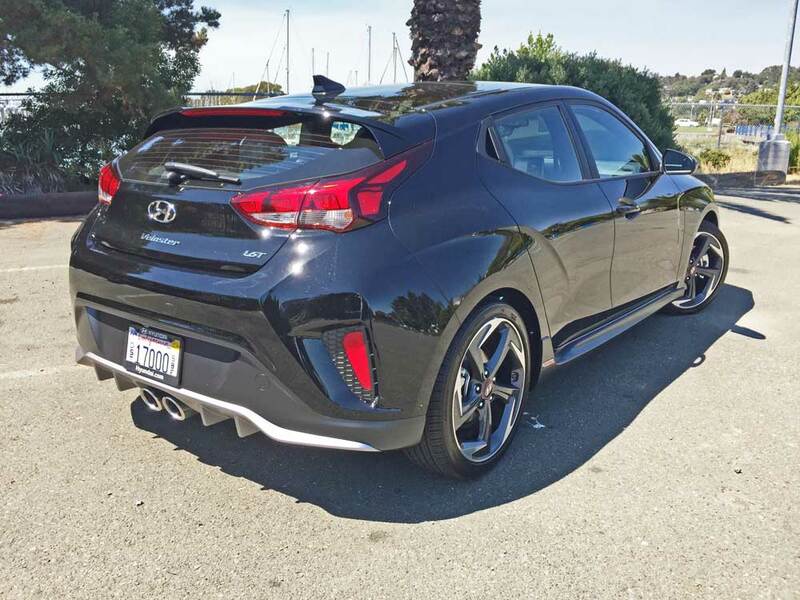 The fresh design for both the 2019 Hyundai Veloster and Hyundai Veloster Turbo is the result of a collaborative effort by Hyundai designers from Seoul, South Korea and the U.S. Design Center in Irvine, CA. 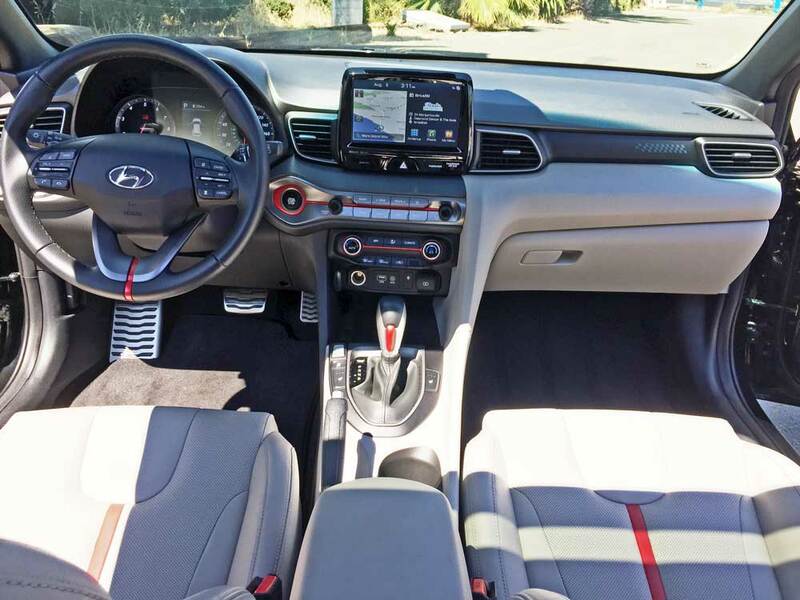 The latest iteration Velosters showcase a comprehensive redesign of both the exterior and interior, along with powertrain enhancements and a host of new and improved infotainment and connectivity features. 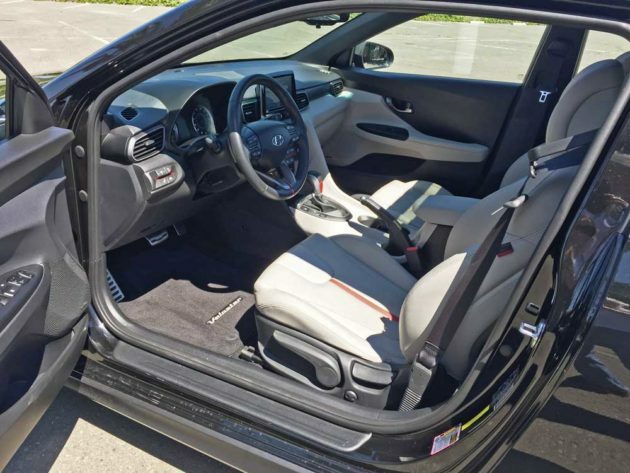 While it is a three-door hatch coupe in right-hand drive markets, the passenger door will move from the right side to the left. 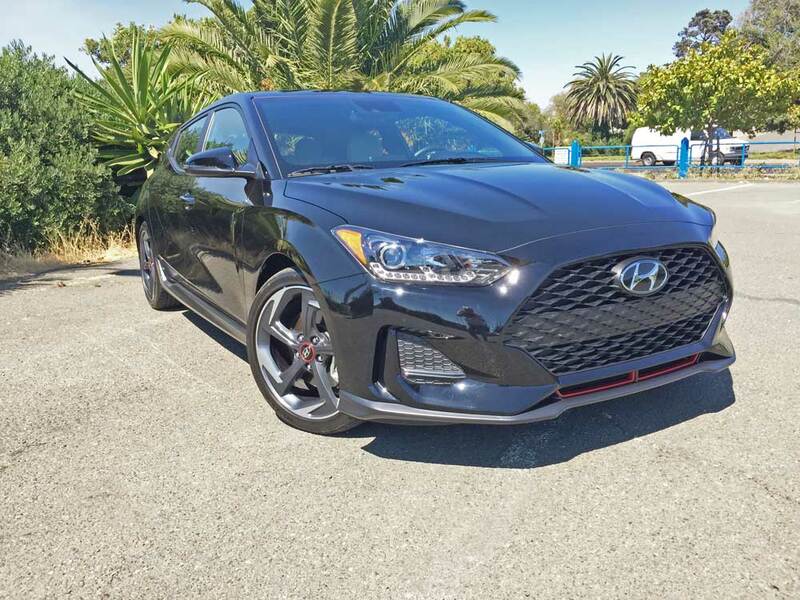 Veloster comes with Hyundai?s new bolder signature hexagonal mesh grille; LED headlight accents and black ?A?-pillars that tend to simulate a motorcycle visor. 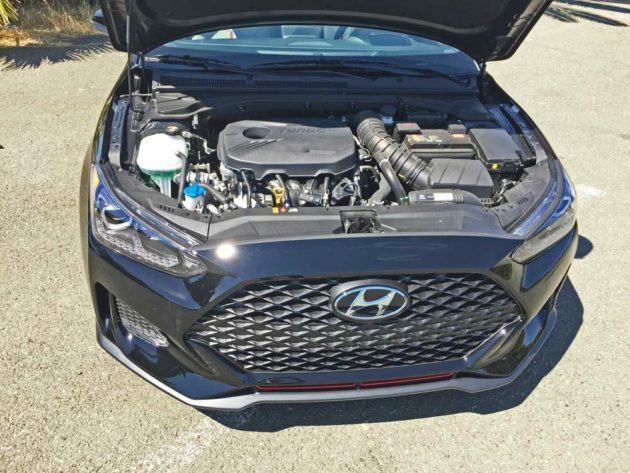 Hyundai?s ?Fluidic? sculptured lines join athletic, pronounced wheel arches fore and aft, body-color door handles and mirrors, as well as wraparound headlights and available, 18-inch alloy wheels all combining and adding to the unusual coupe?s sporty exterior image. Piano black accents complement the front-end look with red-accented lower intakes. Trim levels include: a 2.0-liter manual transmission model starting at $18,500; a 2.0-liter automatic version; a 2.0-liter automatic Premium model.Iin the VelosterTurbo stable is: an R-Spec Manual gearbox model; a 7-speed DCT model; an Ultimate manual and an Ultimate DCT model with a starting price of $28,150. 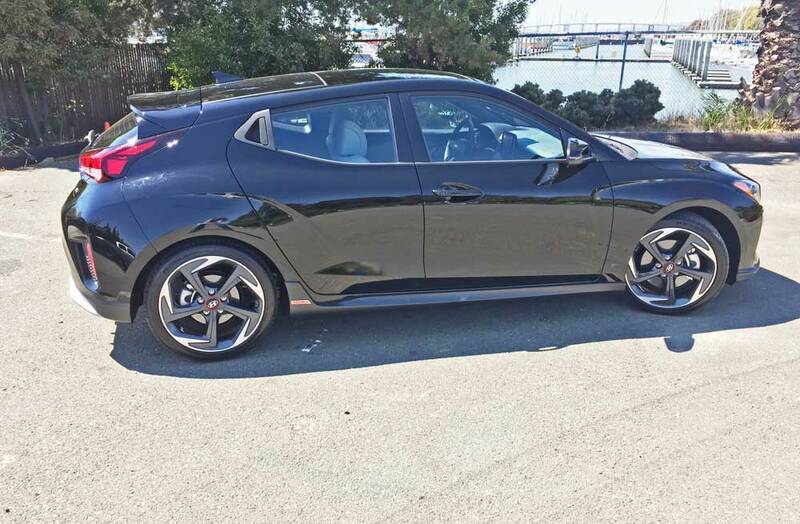 The Veloster?s new shape is focused on dynamic, muscular performance, exhibiting enhanced proportions and volume. Wheel arches and fenders are more pronounced, and the cowl and ?A? pillars are positioned further aft, connecting the hood and belt lines. The lowered roofline arches gracefully aft to an integrated spoiler lip set inboard of the wraparound tail lamps. The rear also features a blacked out diffuser with centered dual chrome tip round exhaust outlets. A backup camera and backup warning sensors are optionally available. The Turbo version features the same wheelbase as the regular Veloster but is 1.2-inches longer and .6-inches wider. The Grille and front fascia are Turbo specific. Moving into the cabin, the interior design continues to draw its inspiration from sport motorcycles, with the dynamic center fascia taken from the tank, the air vent design drawn from mechanically styled, wide mufflers, while the floor console delivers a sporty and sleek profile. Additionally, there?s a Multimedia touch screen, a technical, non-reflective grain on the IP, and stylish, silver-colored grab handles and other trim accents. A proximity key with push-button start is available as is body color and black combination seating, which requires manual adjustment. Hyundai?s next-generation Blue Link? connected Car System is offered, featuring three years of complimentary Blue Link services, with enhanced safety, diagnostic, remote and guidance services. Blue Link features can be accessed via buttons on the rearview mirror, the MyHyundai.com web portal, the Blue Link smartphone app, the Amazon? Alexa Blue Link skill, and the Blue Link Google Assistant app. Some features may be controlled via Android Wear? and Apple Watch? smartwatch apps. The latest release of the Blue Link smartphone app includes: widgets for easy access to remote features, the ability to send Point-of-Interest data to vehicle navigation system (if so equipped) and access to Blue Link notification settings. 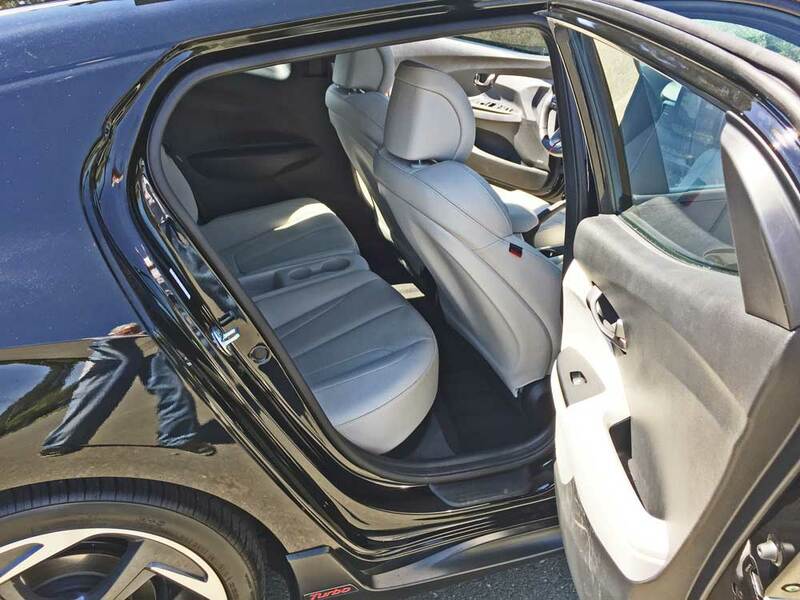 Innovative storage abounds with front map pockets with bottle holders, overhead sunglass storage, front and rear cup holders with storage consoles, a dual-tiered armrest storage box, front seatback storage pockets and front and rear armrest storage pockets. There are two levels of audio systems as well, with Gracenote technology and Pandora. There?s also Bluetooth with voice recognition, cruise control and steering wheel audio controls. A spacious 15.5 cubic-feet of cargo space resides beneath the hatch. Motive force for the 2019 Veloster Turbo model comes from a 1.6-liter, DOHC D-CVVT (Dual Continuously Variable Valve Timing) GDI (Gasoline Direct Injection) four-cylinder engine with a twin-scroll, intercooled turbocharger. The transversely mounted front mill produces 201 horsepower at 6,000 rpm along with 195 pound feet of torque in a range from 1,500 to 4,500 rpm. Energy is geared to the front wheels via either a six-speed manual gearbox with a dry single plate clutch with diaphragm and an EcoShift indicator, or a seven-speed EcoShift DCT automatic transmission with steering wheel mounted paddle shifters, a SHIFTRONIC? manual shift mode and torque converter. My test 2019 Hyundai Veloster Turbo was in Ultimate trim and came with an Ultra Black metallic exterior finish and a Gray interior with Red accents. The base sticker read $28,150., which was elevated to $29,160. after factoring in: the carpeted floor mats and the Inland Freight and Handling Charge. Safety features for the Veloster Turbo include: The Veloster provides an impressive array of safety features, including: six airbags, Vehicle Stability Management, Electronic Stability Control with integrated Traction Control, Hillstart Assist Control (DCT only), ABS with EBD and Brake Assist. 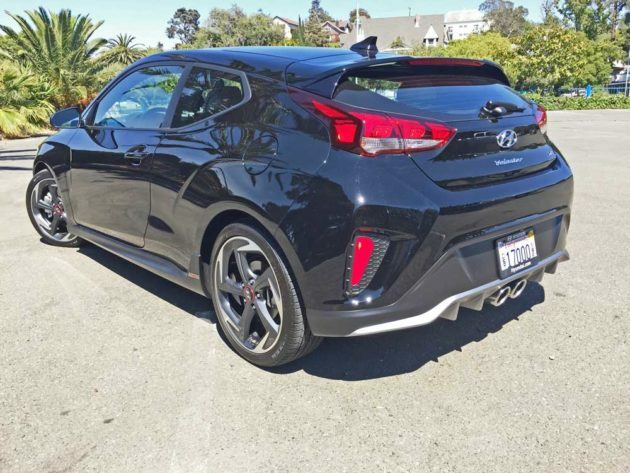 The 2019 Hyundai Veloster Turbo Ultimate represents an incredible value in a compact vehicle that is not only innovative, but displays an extremely, (even if somewhat radical) appeal in its appearance, especially from the rear and side views. It comes with an impressive inventory of standard features and technology, while offering an impressive array of option packaging that provides enhancements for personalization desires and requirements. 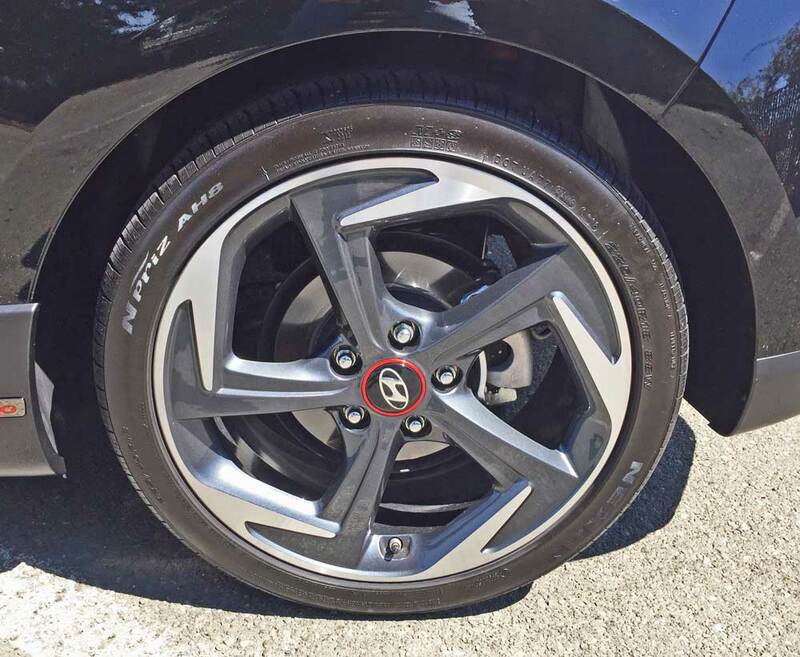 The ride quality is compliant, even with 18-inch wheels and tires, and the handling characteristics are sporty indeed. The power that?s put out by the 1.6-liter four-cylinder turbocharged motor is decidedly more than adequate, and should satisfy those with the need for more speed. The Turbo is obviously superior to the non-turbo. The only negative issue encountered was the rear seat access and room for tall individuals acrobatic ingress and egress is required. In the final scheme of things, this latest iteration Hyundai Veloster Turbo is a most impressive compact vehicle that?s sure to fill the bill for those seeking a sporty, yet economic, compact and technologically innovative vehicle, and its price is really reasonable considering the content level. The Turbo model definitely ups the ante in the performance department with sport-tuned steering and suspension. Engine Type and Size:????? ?1.6-liter Gamma, DOHC D-CVVT (Dual Continuously Variable Valve Timing) GDI (Gasoline Direct Injection) four-cylinder with a twin-scroll, intercooled turbocharger. Transmission:??????????? ? ?Seven-speed EcoShift Dual Clutch automatic with steering wheel mounted paddle shifters. Drive Train:??????????? Transversely mounted front engine / Front-wheel drive. Suspension:???????? ?Front – Independent, MacPherson struts with coil springs, gas-filled hydraulic twin-tube shock?absorbers, and 24mm stabilizer bar. Rear ? Multi-Link with Hydraulic twin-tube Gas-Filled Shock absorbers. Brakes:??????????? ??? ?Power-assisted four-wheel discs (vented front), four-?wheel/four channel ABS, and EBD. Tires:??????????? ???? ?NPriz AH8 225/40R18 T31 ? P225/40 R18 mounted?on five-swirl spoke Machine face and Paint combo alloy wheels.